The library has its own site – http://elib.mpgu.info where it is possible to find the latest news of the library, to visit a photo gallery, to familiarize with contents of the main methodical documents and subject of carried-out exhibitions. 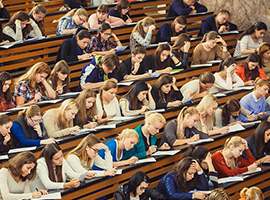 According to the references being on a site, it is possible to pass to the electronic catalog, the MPGU electronic library, and also on pages of other information resources. The history of MPGU library is closely connected with university history. During 140 years of the existence there were successes and fallings. Date of birth of library is considered 1873. At the beginning the completion was according the principle of organization “small libraries” and various societies. The books were used for a certain payment that compensated the costs of literature acquisition. There were the libraries completed by students among which the largest was the library of listeners for all faculties. Only students who payed an annual membership fee could be the readers of such library. In the library there were gathered the books of the historical and philological themes. The library became bigger with literature purchases in bookshops, at private publishing houses and booksellers. Sometimes the students bought the books for their own money. Since 1990 there is a new stage in the history of MPGU – independent libraries at faculties were organized, the material resources and library work was improved. As well as in previous years, teachers and students took direct part in purchase of necessary literature, searching at booksellers of rare editions, the periodical press. Private libraries of scientists were bought. By 1914 the courses had three libraries at faculties and 18 libraries at offices and laboratories. In 1909-1910 academic year the library was visited already by 7.479 people. In 1918 MHCW (hereinafter Moscow High Courses for Women) was transformed to the 2nd State University (the 2nd Moscow State University). It had three faculties in its structure: historical and philological, physical and mathematical and medical. 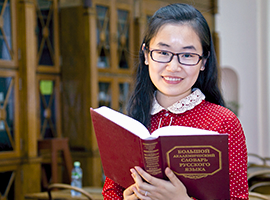 Book funds (44,475 volumes) of the 2nd Moscow State University settled down in two libraries: the fundamental – for humanitarian faculties and in library of natural faculties. The funds continue to replenish with private libraries (prof. E.G.Brown, N. N. Bazhenov, prof. A.N.Veselovsky). In April, 1930 the 2nd Moscow State University was transformed to three independent institutes on the basis of pedagogical, medical and chemical faculties. So there appeared the Moscow State Pedagogical Institute (MSPI) in which library there was a fund of historical and philosophical faculty, literature on philology, biology, mathematics, fiction and the periodical press. In 1931 the main library of MSPI had funds in 140,000 volumes. Funds of 22 libraries at chairs, offices and institute laboratories where 98,790 volumes of Russian and foreign special and reference books on their profile were numbered, were independently allocated. From that time the funds quickly grow, at the expense of increasing allocations for acquisition which was conducted on specialties: pedagogics, linguistics, natural sciences, physical and mathematical sciences, economy, philosophy, psychology, history, geography, art, literature, defectology, etc. During the Great Patriotic War two Moscow Pedagogical Institutes were attached to MSPI – as separate faculty the State pedagogical defectological institute (1941) and the Moscow pedagogical institute in the name of K.Libknekhta (1943), their book funds (about 20,000 volumes) were transferred to the library. Since the beginning of release of the territory of the country from German aggressors the library allocated a part of the funds for the organization or restoration of libraries in the destroyed cities. In 1945 MSPI was assigned the name of V.I.Lenin’s . In the same year the fund of the dissertations protected in MSPI was organized in the library. By 1947 there already were 1100 volumes. In the 1950-es the network of faculty libraries extended and there was a possibility of the differentiated service of readers. This principle remains in the library till today. 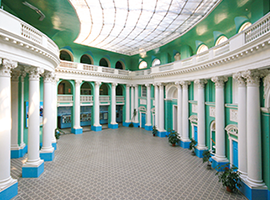 In 1960 together with accession to MSPI of the Moscow city pedagogical institute of Potyomkin’s Accusative their libraries were also incorporated. After merge the MSPI library of V.I.Lenin counted more than 1 million volumes and entered into number of the largest libraries of the city. The next years were filled with division and associations, appearance of new faculties and buildings. The last large reorganization is connected with opening of the case of humanitarian faculties in 1991 in the Southwest where the library having structure more typical for high school library (subscriptions scientific, educational, fiction, a reading room) was organized. Now the library includes 9 faculty libraries located in different districts of Moscow and library of the case of humanitarian faculties. In total library serves readers of 19 faculties of university. There is the fund of rare books numbering about 40 thousand copies in the library. This fund includes a large number of editions of the XVIII-XIX centuries, including: «Grammar» by M.Smotritsky, «Arithmetician» by L.F.Magnitsky, lifetime editions of compositions of A.S. Pushkin, the second edition of the comedy «Woe from Wit» of A.S.Griboedov, the book with I.A.Bunin, K.A.Timiryazev’s autographs, etc. An important role-play books and magazines on training and education of children, including preschool age, fiction for children and adults, religious editions and so on. The library of MPGU is equipped by modern computers and copying equipment. The computer park of library includes 137 computers, 39 from which are provided to readers with free Internet access. All workplaces of librarians also have unlimited Internet access.